Pregnancy journal scrapbook can be great fun way to preserve and share different aspects of your pregnancy. It does not matter whether you have created any scrapbook before or not, as the exciting part is yet to get started as soon as the news, breaks out about you being pregnant. The pregnancy journal scrapbook will record your valued nine-month journey that you may share with your child once they grow up. It would be quite an innovative stuff. There are so many different types of pregnancy journals available in the market. You may choose a hard cover or spiral one that carry pockets to save memorabilia and have pre-printed pages. Moreover, if you prefer to have an ease to share your pregnancy journal among your friends and relatives who stay far off locations, you may go for online option such as pregnancy or baby blogs. As you embark on your wonderful nine-month journey, take ample photographs of your pregnancy at different stages. Photographs may include your visits to the doctor, growing belly, ultrasound photographs, even an outing to get fresh air in the mornings. As you need to record and revisit these memories down the lane, try to click whatever moment you feel is important and exciting. In order to capture these invaluable moments, keep a HD camera always handy with you, as you would never wish to miss registering those moments. Photographs provide depth to the pregnancy scrapbook album. Another important aspect of pregnancy journal scrapbook is recording the moments by writing them down. You may carry a pocket diary with you and as and when you feel like jotting down a note about the moment, you can write in it and later add to the journal. In this way, you would not forget to record those special moments. If you want to do justice to your work, then along with happy moments (news break), do mention unpleasant moments (restricted movements for care). Try to include every detail that you feel is important. It could be you watching movement of your baby in ultrasound machine along with your husband, rushing your husband to fetch something specific to eat from the supermarket around midnight, neighborhood kids asking you on and off about baby’s arrival, privilege on a special moment for you carrying and more. 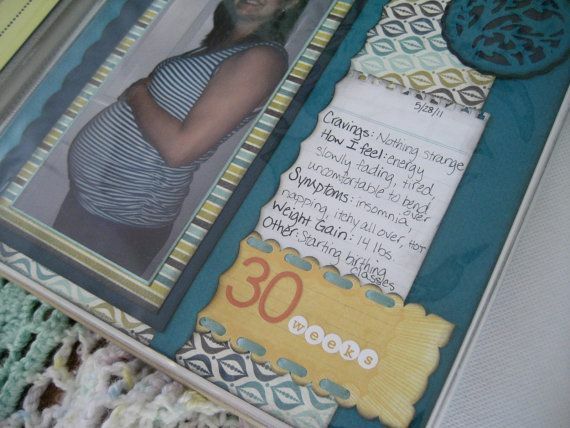 You can include the memorabilia in your pregnancy journal scrapbook or maternity scrapbook. Memorabilia may include anything that relates to your pregnancy period. For instance, a congratulatory gift card from your husband when you told him that you are expecting, tag of the first dress of your baby or anything that relates to your pregnancy you may come across. You can also think of making a pregnancy video and include it in your pregnancy journal scrapbook should you opt for online version of pregnancy journal. Your pregnancy video will document your complete pregnancy and will be a real fun thing to watch and cherish with your loved ones. Let your creative juices flow and get down creating one of your own scrapbooks. Do not forget to include first day photographs of your newborn in your pregnancy and baby scrapbook. You would definitely feel proud that you made this lovely treasured journal.